As a part-timer Euripides must count as a trogloxene. St Jerome was another, and St Ninian, whose cave I've visited. Misanthropy and cave-dwelling go hand in hand. I wonder if 'troglodyte' and 'troll' are enough for 'tro-' to qualify as a bona fide phonaestheme....If the ascetic life is called for I think I'd prefer trees. 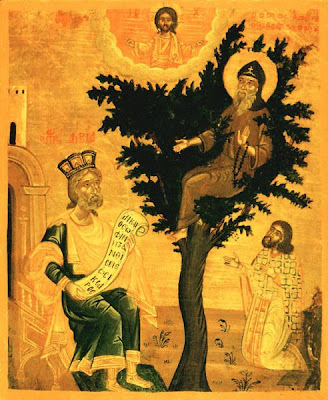 David the Dendrite of Thessalonica managed three years in an almond tree, and Adolas even had a flap fitted in his hollowed plane tree to converse with visitors (Greek text of John Moschus in C. P. Charalampidis, The Dendrites in Pre-Christian and Christian Historical-Literary Tradition and Iconography, Studia Archaeologica 73 (Rome: L’Erma di Bretschneider, 1995), p. 73 [Google books preview]). Maro the Dendrite was another but not of such a welcoming disposition as he used to shut the door of his tree whenever he heard people approach. A trogloxene is "an animal that spends occasional short periods in dark caves" (OED, s.v. troglo-), as opposed to a troglobite, "an animal living entirely in the dark parts of caves" (id.). A phonaestheme is "a phoneme or group of phonemes having recognizable semantic associations, as a result of appearing in a number of words of similar meaning" (OED, s.v., coined by J. Firth in 1930). On dendrites, see also Michael Whitby, "Maro the Dendrite: An Anti-Social Holy Man," in Homo Viator: Classical Essays for John Bramble (Bristol: Bristol Classical Press, 1987), pp. 309-317, and Kyle Smith, "Dendrites and Other Standers in the History of the Exploits of Bishop Paul of Qanetos and Priest John of Edessa" Hugoye: Journal of Syriac Studies 12.1 (Winter 2009) 117-134. The OED doesn't recognize this meaning of dendrite (from Greek δένδρον = tree), but it seems sufficiently widespread in scholarly literature to deserve a dictionary definition, such as "an ascetic who lives in a tree"  see Susan Ashbrook Harvey in G.W. Bowersock, ed., Late Antiquity: A Guide to the Postclassical World, 2nd ed. (Cambridge: Harvard University Press, 1999), p. 407 (s.v. dendrites).